ZIGGY - Still smiling after his op! Ooh, only hurts when I laugh!!! Our window seat, we are spoilt! 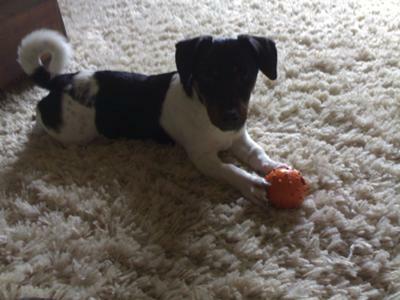 This is a photo of my younger JRT, Ziggy at six months old. He had not long had his 'bits' removed but he still managed a smile for the camera! Or is it a grimace? Lol. It never fails to make me smile, I hope it does you too. 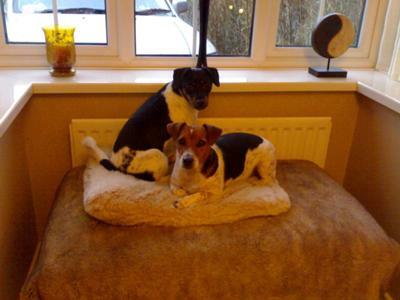 He's now a fit and healthy 2 & half years old & runs riot with my other 3 & half year old JRT, Roxy. Comments for ZIGGY - Still smiling after his op! 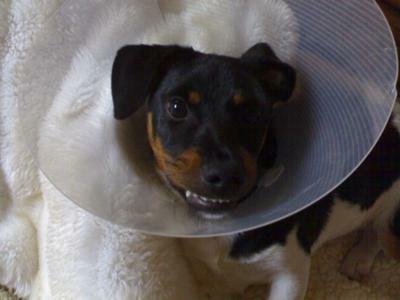 What a brave little Ziggy to be able to smile when his manhood has been taken away from him.